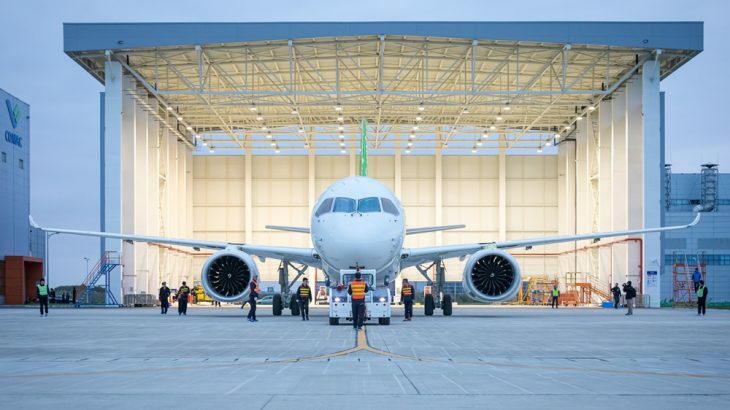 China’s first large domestically designed and built passenger jetliner has passed a major technical assessment bringing it closer to its maiden flight. An evaluation committee consisting of 63 aviation specialists from across China has agreed the C919 is technically ready for its maiden flight， said the Shanghai-based aircraft maker， Commercial Aircraft Corp. of China (COMAC) in a press release on March 25. The committee has proven the C919 is technically airworthy but the jet is still subject to electromagnetic compatibility and taxiing tests before it takes to the air. The jet was built in 2015 and COMAC completed the onboard systems installation as well as major static and system integration tests before the technical assessment. 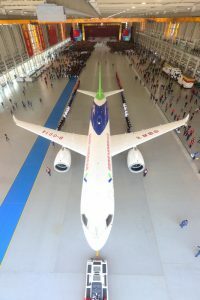 The C919 has more than 150 seats and a standard range of 4075 kilometers and will compete with the Airbus 320 and Boeing’s 737，which currently dominate the market. 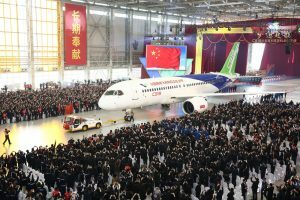 At the end of 2016,23 customers had placed orders for more than Five Hundred C919 aircraft. China’s first regional commercial aircraft, the ARJ21，began commercial operation in June 2016. C919 aircraft is a large civil jet aircraft independently developed by China in accordance with international civil aviation regulations, and owns independent intellectual property right. C919 aircraft has a layout of 158 to 174 seats, and a range of 4,075 to 5,555 kilometers. Test on iron bird test rig has been started, the static test of the wing-to-fuselage junction has been completed successfully, and components have been put into production. Large sections, such as nose, forward fuselage and mid fuselage/center wing, have rolled out in succession, and structure assembly of the first aircraft has been started. The first aircraft rolled out on November 2nd, 2015. A total of 570 orders have been received from 23 customers.